But to critics, his words are refuted by the reality on the ground and, to a certain extent, by the State Department's own report, an unclassified version of which was obtained by ABC News. 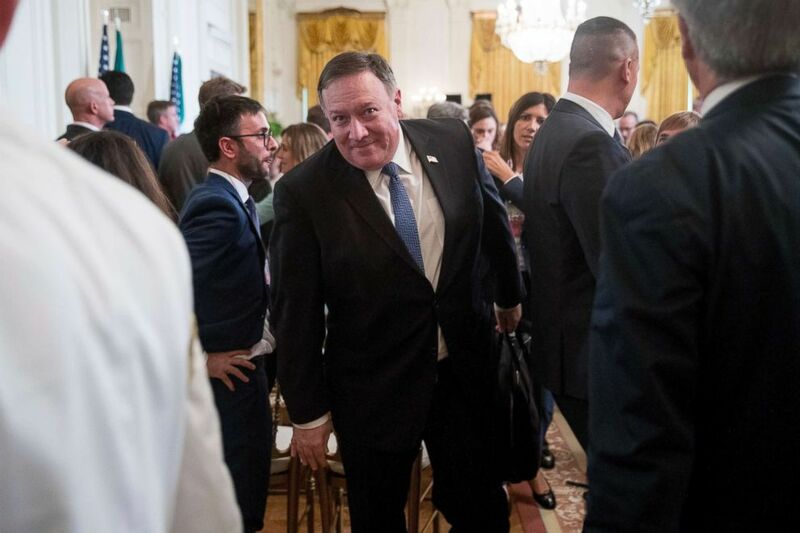 The certification from Pompeo means that the U.S. will continue to assist the Saudi-led coalition with mid-air refueling for its war planes. But it comes amid mounting pressure from Congress and the public to withdraw the U.S. support that includes not just refueling jets but sharing intelligence and selling advanced weaponry. Saudi Arabia and UAE have been fighting in Yemen since 2015, when the Houthis -- an Iranian-backed Shia group -- took control of the government in the capital, Sanaa, and ousted the government. A brutal civil war, the conflict has raged for three years now with allegations of human rights abuses and war crimes on both sides -- but in particular, the Saudis, Emiratis and their Yemeni government allies are responsible for "most direct civilian casualties," according to a United Nations report last month that accused them of targeting residential areas, markets, funerals, weddings, detention facilities, civilian boats and even medical facilities. The backlash in the U.S. to the American military's support for both countries led to a provision in this year's defense spending bill that required the administration to brief Congress within 30 days on the war, and certify that the Saudis and Emiratis were taking steps to minimize civilian casualties and implement a peace process. Outrage has grown over the coalition's bombing campaign after it hit a school bus and killed more than 40 children and several adults Aug 9, and then dozens of children and women in another bombardment a week later. The Saudis, however, said they have taken steps, including finding fault during their investigation of the school bus bombing. They have also maintained that the Houthis are a legitimate threat to Saudis, pointing to rocket attacks including a handful that have come close to Riyadh's airport. Secretary of State Mike Pompeo, center, departs a news conference with President Donald Trump and Italian Prime Minister Giuseppe Conte in the East Room of the White House, Monday, July 30, 2018. "What Pompeo said is actually accurate despite all the naysayers. A huge effort is being made to improve targeting and work to avoid such accidents, and the U.S. is very aware of that," Ali Shihabi, founder of the Arabia Foundation in Washington, which has close ties to the kingdom, said in an email. By Wednesday, the Trump administration was obligated to provide a briefing to Congress on the conflict, including the successes of the Saudi and Emirati military campaign, the Houthi rebels' human rights abuses and sources of support, and the impact on al Qaeda in the Arabian Peninsula, aka AQAP -- widely seen as the most dangerous branch of the terror group. While the deadline for that classified briefing was Wednesday, it's actually scheduled for Sept. 20, according to two Congressional aides and a State Department official. But several lawmakers are already up in arms over the certification. "We need to hold our allies to a higher standard and, unfortunately, this certification fails in that regard," said Sen. Jeanne Shaheen, D-N.H., who co-authored the section of the defense bill that created the reporting requirements. "It is evident that the administration is deliberately sidestepping congressional oversight." Her Republican co-sponsor, Sen. Todd Young of Indiana, expressed urgency this week in a joint op-ed with Shaheen, and on Friday, his office issued a statement to ABC News, saying, "Many questions remain ... I will be addressing my concerns directly with the administration over the coming days, and I will continue to fight to hold our partners accountable." Sen. Rand Paul, R-Ky., who opposed U.S. arms for the Saudi campaign virtually from the start of the conflict, and who at one time held up arms sales to the country, declined to comment. Democrats had sharper words for the administration. "How can the Trump administration deny what everyone can see with our own two eyes?" Sen. Chris Murphy, D-Conn., said in a statement. "These certifications are a farce, and we should all be ashamed that our government is turning a blind eye to likely war crimes." There is also movement to do something about it. In her statement, Shaheen pointed to certification deadlines in 180 and 360 days when the administration must again certify that Saudi Arabia and UAE are taking steps to reduce civilian casualties and end the war. But other lawmakers don't want to wait. Last year, Khanna was the sole sponsor of a war powers resolution to withdraw U.S. forces from any role in the Yemeni conflict. Now, he is set to introduce the same bill with the ranking members of the House Armed Services Committee and Rules Committee as co-sponsors, among eight others. Last March, a similar vote died in the Senate, but it did garner 44 votes, including from five Republicans.